I sat down the other day for a interview with a rider who is a former #1 National Vintage plate holder, Dennis Goyer. When you are walking around in the back pits at Square Deal Riders you will find a pit space with usually two or three nice looking vintage flat track bikes sporting the no. 611. Goyer’s takes pride in his machines keeping them fresh and good looking, but when he is out on the track turning left it’s all business. Here is my interview with Dennis enjoy. When and where did you start racing? 1986 I raced my first car at Lebanon Valley, I was 17. 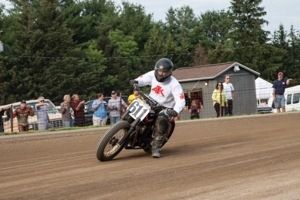 I discovered flattrack racing when I was racing vintage MX which I did for many years. I was at Hurricane Hills MX in southern Pa, I believe it was 2007. The track owner announced at the riders meeting he was running the short track that evening and they had a knobby class, so I entered. I took a 3rd on my 1986 yz490 with no rear brake (it vibrated off). 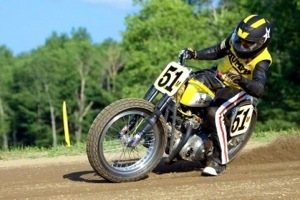 After that, I was hooked on flattrack and resolved myself to building a bike even though I had no idea yet as to how. I have the most fun on cushion tracks like Square Deal or Wauseon, although Savannah is my favorite track even though it’s clay because of the crazy speed. Who did you, or even still do look up to in your sport and why? I know it sounds cliché but I have always looked up to my dad. I grew up with him in the garage. He was always racing something when I was a kid whether it was snowmobiles, stock cars, dirt modifieds, or migets. He taught me what I know about motors, mechanics and fabrication. If it weren’t for him, I wouldn’t have raced anything. My biggest disappointment is that I didn’t discover this sport sooner. I spent years racing cars and the MX bikes. 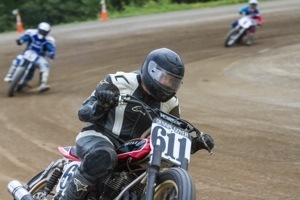 Had I known about flattrack, I would have been doing this all along. What has been your biggest accomplishment or best memory in your racing carrier? My best memory is receiving the #1 plate for the Vintage National 500 masters class on the stage in Las Vegas with Joe Bromley. That was really cool. What is something that you have always wanted to do while racing but haven’t been able to yet? I want to build my own rigid brakeless vintage bike. I have ridden others and thought it was really fun and the bikes are really cool. Go to a riding school like American Supercamp. I just went there and they showed me what I have been doing wrong. PCW racing builds my awesome race motors, I have been helped so much with advice by so many people I have met since I have been involved in this sport, and I couldn’t list them all. The people I have met is one of the biggest reasons I love this sport. Where can people follow your on social media, or a website that they can follow you though out your season? I do have a personal facebook account. Everyone should come out to the races and check out this awesome sport for themselves. Can you explain some of the differences in riding a vintage bike and riding a new style bike. And why you enjoy the vintage bike more. The difference between a vintage bike and the modern DTX bikes in my opinion is that the vintage bikes are framers. They have such character and I love building them almost as much as I love riding them. They have such a clean, custom style and I just love to look at them. I catch myself just staring at them in the garage sometimes. Vintage racing is also more fun because the bike is a custom one of a kind machine. Its personality can come into play during a race as much as the rider on it. The modern DTX bikes all very advanced, well engineered and also just the same. Let the fans know what was the best thing you learned at the riding school. The best thing they taught me was what parts of your body are used to ride a motorcycle. They not only told me, they proved it in instructional drills. They taught me how properly using the lower body is much more important than the arms. It was a tremendously eye opening experience, and I really hope I can put into practice what they taught me this season. Under The Helmet wanted to go deeper into what it’s like to get on top of a two wheel machine that wants to buck the rider off when ever they relax for a second. Flat Track Rider Toby Stay and I went a few extra laps to help you fans understand what it is like to run down the back stretch at Springfield going over a 115 MPH. I ask Toby to explain what it is like to run on the mile. This is how he explained it. If that doesn’t raise the hairs on the back of your neck I don’t know what will. Next time you go to watch these guys and gals get it done in the dirt, remember how much courage it takes to throw a leg over the seat and put on a show for the fans. Growing up Toby has raced against the top names in the sport. Corey Texter finished second to Stay on the mile in Springfield. He also raced with now national riders Matt Weidman, Brad Baker, and Brandon Robinson. So can you explain to the fans what goes on during the week before a race with maintenance on your bike and what kind of training is needed to run up front in this sport? Do you get to ride as part of your training or is most of it done in the gym? For me the week before a race can get pretty hectic at times. Between work, family and everyday life things can get pretty busy making it hard to sneak out to the race shop every night of the week. Luckily for me I married a very understanding racer chick. Bike prep varies depending on the race and race track. But it tends to consist of cleaning the bike, the filters, changing oil and tires if need be, washing the riding gear and cleaning out the race van. Hopefully nothing got banged up from the weekends race if so, that stuff has to be addressed first. Just in case you have to order any parts to get here by next weekend! Every few races I like to check the valves to make sure everything is still in tune. Ideally a fresh piston and rings get changed half way through the season. I know this is far from the case for the National guys as their doing complete rebuilds every other race if not every one. As far as training goes I’m at the gym a lot, 4-5 times a week most times twice a day. Unfortunately riding isn’t an option for me at the moment due to lack of a practice bike. In my opinion there is NO better training then riding a motorcycle. The more you’re on a bike the more comfortable and faster you’ll get. Just like any other sport, practice makes perfect, and in doing so putting you further up front. You can use every machine in a gym and never touch half the muscles you use while racing a motorcycle. But, you do what you can with what you have. How big a part does nutrition play in your training program? I would say nutrition has become one of the biggest parts in my training program. Over the off season I really stepped it up with the help of my advisor and Advocare. It’s helped me better understand what my body needs. I’ve noticed a lot of positive changes in my training and I look forward to using that to better myself this season. What are some of the things that go on during your season that the average fan might not know? What people don’t see are the hours spent at the gym, the hours riding day after day until you have blisters on your hands, or even the hours spent driving all night to get to the next track. Just this winter I’ve seen numerous posts and pictures from Kenny Coolbeth riding motocross this day, traveling and ice riding the next day. Brad Baker raced over in Europe and has been racing almost every weekend from what I can see on his social feeds. These guys eat, sleep and breathe this sport. It’s what they live for, it’s their job and their damn good at it. If you train like a champion, you will be a champion. Kenny Coolbeth and Brad Baker obviously know what it takes. 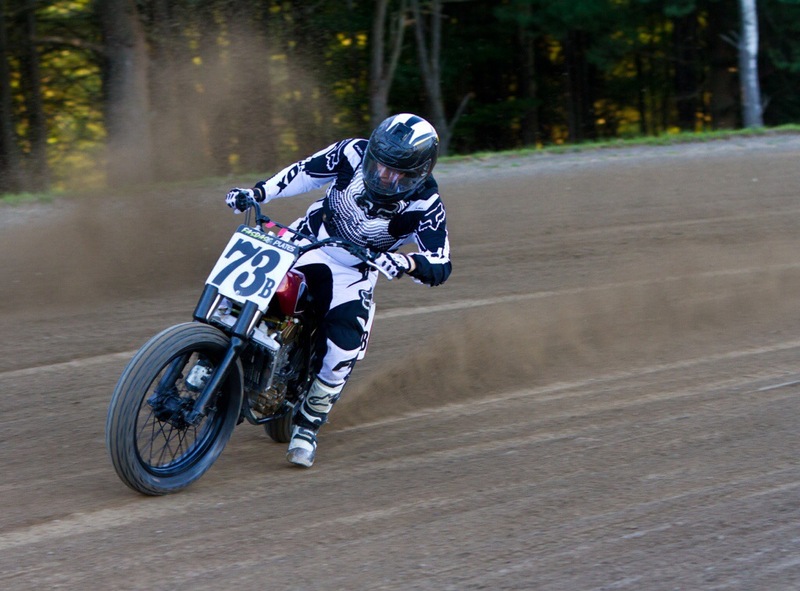 Find a local dirt track in your area and go check out these local “Dare Devils”. This past weekend I did my first interview for Under The Helmet. Flat Track Rider Toby Stay was nice enough to be my first victim. I sent Toby a message asking him if he would like to do a interview for my blog, he accepted, so I jotted down some questions and sent them out to him. If you read Toby’s interview you noticed that he said that he had won a race in Springfield on the mile, and he was disappointed when he didn’t get his National number a few years back. This made me step back and say wow there is a lot more that I would like to ask Mr. Stay about those important moments in his young career. As a fellow racer I can understand his disappointment and his excitement that he felt at those races. The point of doing this blog is to get into the heart of a racer and see what it is like to put on a helmet and risk your life every time you pull out of the pits. Click the follow button at the bottom of this blog to find out more about what makes a racer tick.